Bee Swarm is fortunate enough to have the support of many individuals and companies that help us in the effort to keep bees safe. The great people at The Coffee Store give us sacks. OK, so why would anyone want sacks? Bee keepers use sacking in their smokers to provide a constant source of smoke that is used to keep the bees placid when they get a little too excited. Ecrotek are New Zealand’s largest supplier of bee keeping equipment. They supply many of our bee keepers with all the supplies that we need to keep our bees save and allow them to flourish. 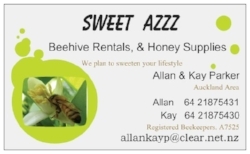 Sweet Azzz are legends in the local bee keeping industry in Auckland. Allan and Kay Parker spend a great deal of time collecting swarms, educating the public about bees and donating their time and effort to local schools to bring bee keeping into the community. Sweet Azzz run many hives in South Auckland located in schools; allowing the students to get a hands on experience with running the bee hives and caring for the bees. Trev can also be found on Facebook here.